Having returned from the UK recently we were ready to go camping in the bush again and make the most of the warm weather before it becomes our tropical wet season. Our plan was to head north for a few days and observe the concentrated bird-life around the remaining ephemeral lakes and observe some of the birds that had arrived in the north of Australia over the past few weeks. It was a relaxing camping trip with time to enjoy all that the land offers late in November, but with the first light occurring at 04:40am we were awake rather early thanks to the vocal bird-life! There had been recent rain to the north and we encountered two isolated tropical storms during our trip, but it didn’t affect our birding or camping. 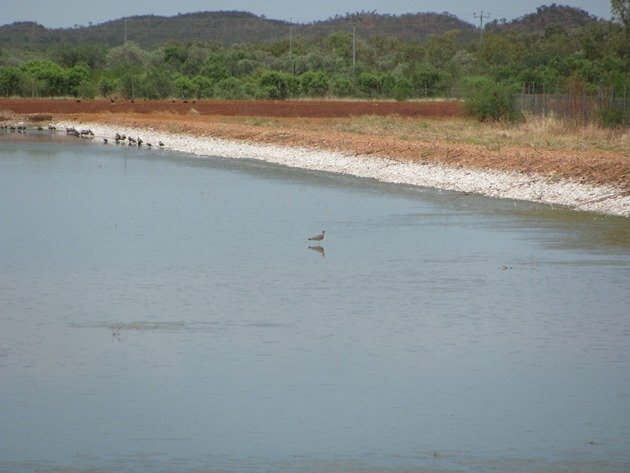 We planned to travel as far north as Halls Creek to visit the Poo Ponds, which is a “must see” destination if you are heading through the township! 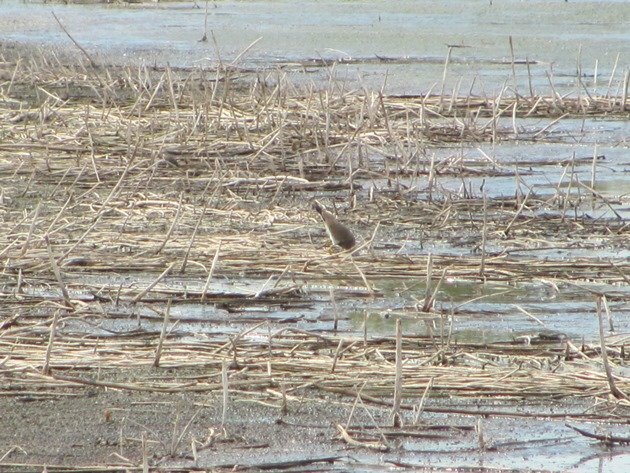 As with our trip to Saltfleetby in the UK, where we checked online first to see if any bird of interest was about and discovered there was a Long-billed Dowitcher to keep an eye out for, we checked the Western Australia Unusual Bird Sightings website. 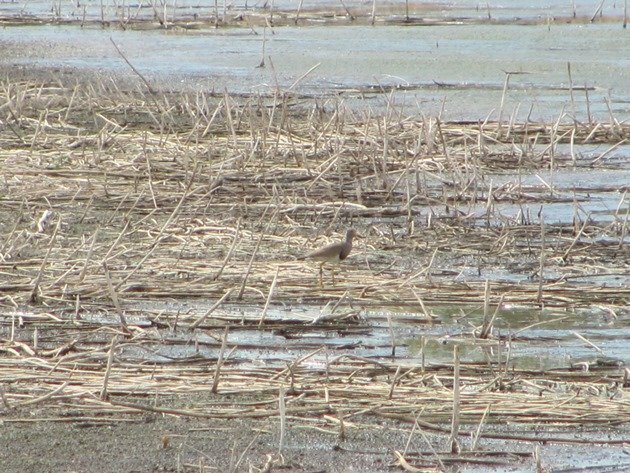 We were surprised to see that a Grey-headed Lapwing had been observed at the Halls Creek Poo Ponds during October, which is apparently only the fifth record for Australia. We don’t “twitch” birds, but it would be a bird to look out for during our visit. The Grey-headed Lapwing-Vanellus cinereus breeds in north-east China and Japan between April and June and then migrate to spend the winter in northern Southeast Asia from northeastern India to Cambodia and southern Japan. However, there have been vagrant Grey-headed lapwings that have been observed in Russia, the Philippines, Indonesia and Australia. The first record in Australia, initially observed by Karen and Brett Davis, was in the small township of Burren Burren in northern New South Wales on 19th June 2006. It was “twitched” by huge numbers of birders keen to add it to their Australian bird list. It remained in the area until 7th October 2006 and was accepted by the Birds Australia Rarities Committee as Case no. 442. Rarities are all given Case numbers and our Temminck’s Stint “first for Australia” two years ago was Case no. 893. 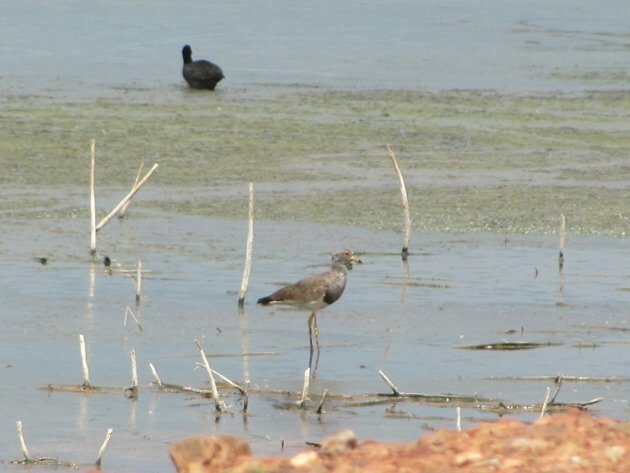 The second sighting of a Grey-headed Lapwing was at Amata in South Australia some years later followed by a third sighting in 2014 in Victoria and then the fourth sighting at Penrith Lakes, Western Sydney, in September 2015. 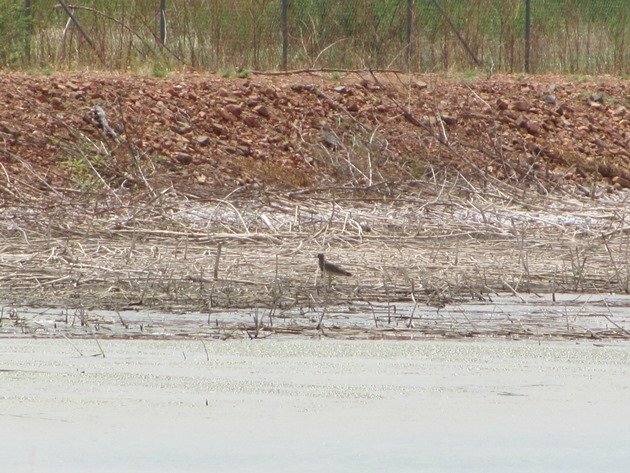 The sighting of the Grey-headed Lapwing at the Halls Creek Poo Ponds was the most northerly record of this particular bird in Australia. The habitat is very suitable with ample shallow water with plentiful insects and we were hopeful it may still be in the area. 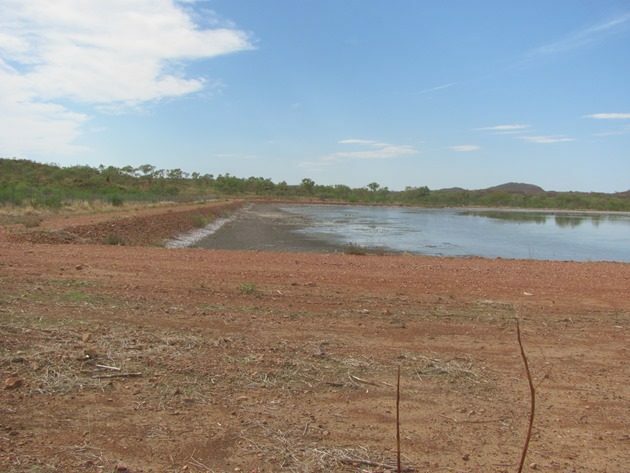 We arrived at the Halls Creek Poo Ponds on the morning of the 24th November at 8am, having camped in the bush to the south the previous night where we observed a pair of Channel-billed Cuckoos being chased off by a Torresian Crow. Approaching the Poo Ponds slowly we observed Budgerigars, Zebra Finch, Fairy Martins, Yellow-throated Miners, White-breasted Woodswallows, Magpie-larks, Willie Wagtails, Crested Pigeons, Pied Butcherbirds, Black-faced Woodswallows, Red-backed Kingfisher, Azure Kingfisher, Galahs and Red-backed Fairy-wrens. 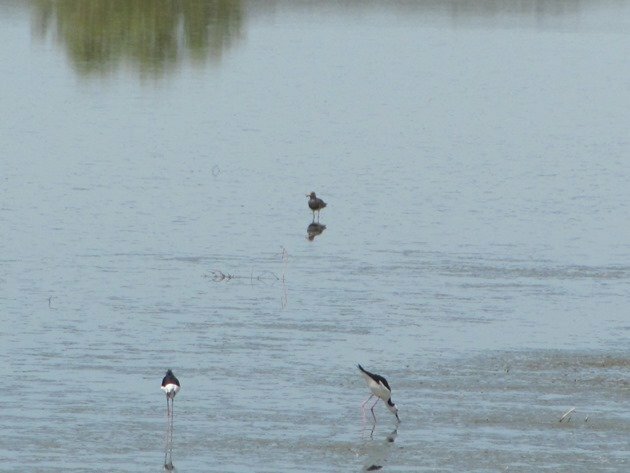 Over one hundred Black-winged Stilt lined the banks of the ponds and were wading in the shallows alongside eighteen Red-necked Avocets. Ducks were well represented by Pacific Black Ducks, Plumed Whistling Ducks, Grey Teal, Pink-eared Ducks and Hardheads. Migratory shorebirds were also well represented with Wood Sandpiper, Common Greenshank, Common Sandpiper, Sharp-tailed Sandpiper and Marsh Sandpiper. Interestingly there was only one Masked Lapwing present! 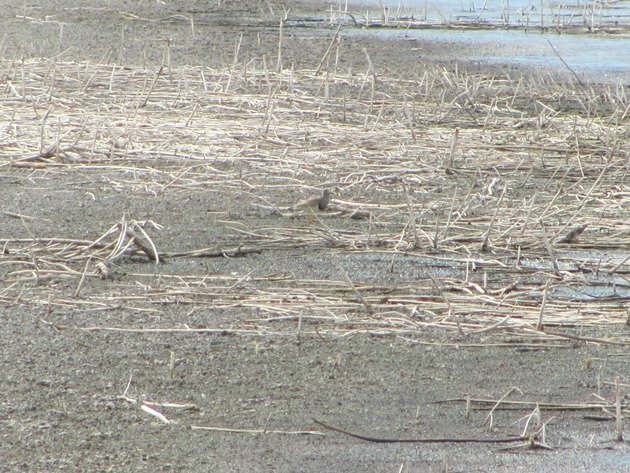 We slowly drove around the graded gravel track to the far end of the ponds to get the best light and to see if the Grey-headed Lapwing was among the birds that day. We were of course delighted to see that the Grey-headed Lapwing was feeding on the muddy edges and it is a spectacular large bird with brightly coloured yellow legs and a yellow bill with a black tip. Due to the fence it is problematic taking photos, because with a small camera you are basically putting the lens through the mesh and hoping for the best! We spent the next few hours observing the Grey-headed Lapwing and walking the perimeter fence. The Grey-headed Lapwing flew on two occasions when we were not close by, so I was unable to capture any photos of it in flight. It was however very distinct with its breast pattern, black tail and black wing tips. It continued to feed along the edges for much of the morning and on one occasion stood in the shallow water for some time. The bush track walk around the ponds added numerous other birds to the list including Whistling Kites, Black Kites, Black-breasted Buzzard, Brown Goshawk, Nankeen Kestrel, two Wedge-tailed Eagles, Spotted Harrier, Rainbow Bee-eaters, Black-fronted Dotterels, Red-kneed Dotterels, Hoary-headed Grebes, Australasian Grebes, Eurasian Coot, Little Black Cormorant, Golden-headed Cisticolas, Black-faced Cuckoo-shrike, Little Woodswallow, White-faced Herons, Brown Honeyeaters, Rufous-throated Honeyeaters, White-gaped Honeyeaters, Singing Honeyeaters, Little Friarbird, Rufous Whistler, Rufous Songlark, White-winged Trillers, Great Bowerbird, Jacky Winter, Peaceful Doves, Diamond Doves, Variegated Fairy-wrens, one Australian Pelican, Pheasant Coucal, White-throated Gerygone, Horsefield’s Bronze Cuckoo, Tree Martin, Paperbark Flycatcher and both Australian Pratincoles and Oriental Pratincoles. 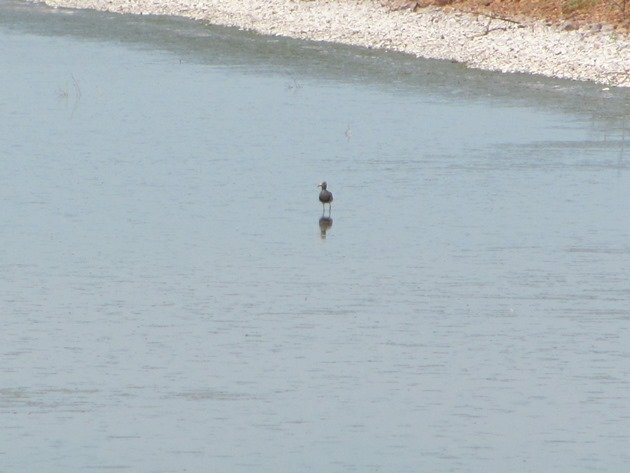 It was an impressive selection of birds for a hot November day at the Halls Creek Poo Ponds regardless of whether we had seen the Grey-headed Lapwing or not, but of course it was the highlight of our trip! Spinifex Pigeons were not observed at the Poo Ponds on this occasion, but we observed over one hundred later in the day at a quarry that was still very full of water unlike on our visit late last year. 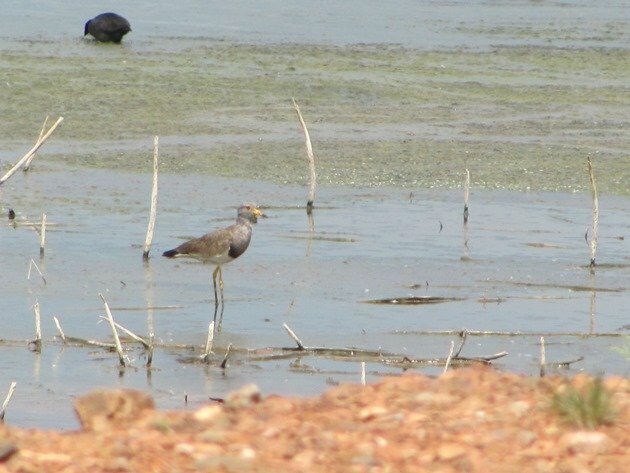 It is of course an unknown factor how often the Grey-headed Lapwing arrives in Australia and does not even get noticed, but for 2017 it was observed in Halls Creek in the Kimberley and we were able to spend a few hours enjoying its presence! Maybe in the future it will be noticed more often and become a more regular vagrant! The Grey-headed Lapwing did make it into the new Australian Bird Guide earlier this year! There have been a few birders that have “twitched” the Grey-headed Lapwing in Halls Creek with much bigger cameras than myself and their excellent photos are available for viewing on eBird.